Former London Marathon winner Sarah Piercy and engineering students and lecturers from University of Plymouth are celebrating after setting a new world record. On their final run at the World Human Powered Speed Challenge (WHPSC) in Battle Mountain, Nevada, Sarah managed to power the University-designed handcycle to a speed of 24.85mph – beating the previous mark by just 0.1mph. It was the culmination of a year of preparation, which had seen Sarah complete numerous tests on the tarmac at RAF St Mawgan in Cornwall. But she had also been working closely with students and lecturers from the Faculty of Health and Human Sciences – including physiotherapists, nutritionists and sports psychologists – to ensure she was in the best possible shape for the record attempt. Sarah, who lives near Exeter, has a condition called arthrogryposis multiplex congenita, which can lead to a contracting of the joints. But it has not stopped her completing 10 London Marathons – winning the women’s wheelchair race in 2000 – and enjoying success in a number of other races across the UK. 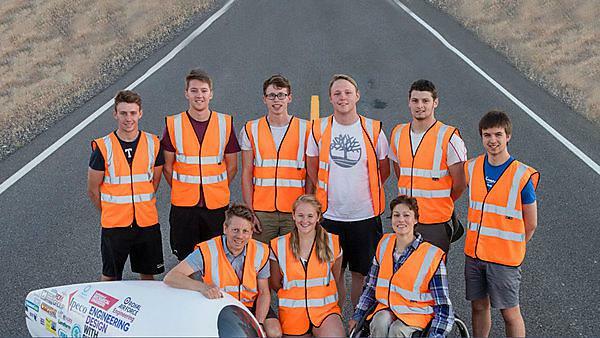 This was the second year that the University of Plymouth has travelled to the United States to take part in the WHPSC competition, which includes a run-up of up to five miles on a straight, flat, high altitude road before a timed section of 200 metres. The week-long event had seen Sarah exceed 22mph on numerous occasions, but strong winds and technical difficulties had hampered any progress until the final successful run. The record attempt was made possible by a range of sponsors, including Wyedean Canoe and Adventure Centre; RDM Group; BT; Landform; Shannon Signs; R.A. Rodriguez (UK) Ltd; Royal Air Force Engineering; Algeos; Putnams; the Institution of Mechanical Engineers; XMA; Ipeco Composites; ACMC; Baron Controls LLC; Certini Bicycle Company; Sunrise Software; Inspired Cycle Engineering; Cyclepowermeters.com.